Appetizer, antipasto, canapé, starter, finger food, munchies, samples, hors d’oeuvre, whatever you call it, if your life is anything like mine, your kitchen is filled with them this holiday season. From work functions, to family get-togethers and tacky sweater parties, each one involves some sort of tasty tidbit or two. I love appetizers! I’d rather have a meal of 3 to 5 small bites and a charcuterie tray, than a full chicken fried steak dinner any time. Let’s take a moment to break down a great appetizer or starter course. As a host, the appetizer sets off the tone of you party. As a guest, it shows your excitement for the people around you and thankfulness to the host for inviting you into their home. Appetizers don’t have to be difficult, in fact, some of the best munchies I’ve eaten are the easiest ones! Thanks to pinterest, the options for great apps recipes out there are endless! I’ve tried to help you out a little bit this season by pulling together some of my favorites, sharing 2 of my new creations, and telling you what to look for when you’re out there on the internet scrolling through endless pinterest pictures. Let’s start with what to look for in a good holiday starter recipe. First and foremost, simplicity. A starter shouldn’t be overly complicated, but it should have great flavor. Look for something you can make ahead and serve cold or hot. Having something that doesn’t have to be reheated or warmed is essential when going to someone's house. If you’re hosting a dinner party, look for something that can be made ahead of time and doesn’t require you to “serve” it. There are some great recipes out there. I’ll share some of my favorites in a bit, but first I want to give you a taste of two recipes that I came up with recently. First up is the Sweet Potato Tart with Sage Brown Butter. This tart features Swiss cheese, caramelized onions, sweet potato, sage brown butter, and most importantly, bacon. Next, Rosemary Honey Goat Cheese Pear Puffs. 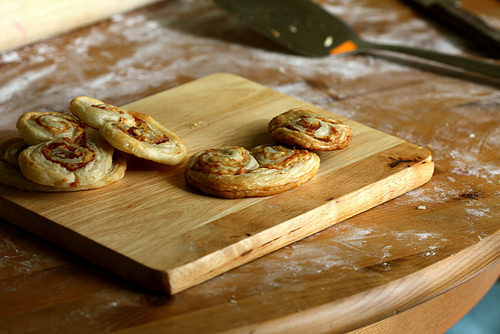 Puff pastry filled with goat cheese, caramelized onions, pears, prosciutto, and rosemary honey make this bite sized snack a great take-anywhere appetizer. Make these great recipes together, and give yourself two really different-tasting starters in half the time. Make these recipes ahead of time and reheat or serve at room temperature. If you have two Christmases, these are the recipes for you! Take one to Nana’s and one to Auntie Pat’s and everyone will be impressed. This recipe is wonderful right out of the oven, served room temperature, or reheated. Making it a perfect recipe for this time of year. It looks elegant, but it is couldn't be any easier. I typically don't use a store-bought crust, but I was in a rush and picked up a frozen one from Trader Joe's. The tarts came out perfect! If you're not going to make it from scratch (here's my favorite recipe), Trader Joe's is the next best thing. heat the butter and sage leaves in a small pan on a medium low heat until the butter starts to brown, be careful, it can burn very easily! Is there anything better than puff pastry? I think not. I keep puff pastry in my freezer at all times, just in case I ever need a last-minute dessert or if someone is going to drop by for coffee and I want to offer them a savory treat. Puff pastry is so versatile, it should be a "pantry staple". If none of these tickle your fancy, give one of the recipes below a try. These are Capital Confessions tested and approved! Butternut Squash Soup from Whisking Through Life (Thanks to Lauren for sharing this!) If you’re looking for yummy baked goods, Lauren is your girl. She’s got recipes for every occasion! I hope one of these makes it on your holiday menu this season. If you have a go-to recipe, share it below!